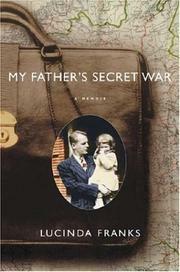 A reporter for the New York Times, emotionally estranged from her father for most of her adult life, reconciles with him as she gradually, then obsessively, uncovers the story of his covert military activities during World War II. Franks, author of the novel Wild Apples (1991), begins with a childhood memory—wiping out on her bicycle, then lying bloody in her father’s sheltering arms. But, as she quickly notes, there was little intimacy between them thereafter. She was angry with him for his ill treatment of her mother (who died in 1976), which included a long affair with a woman named Pat; for his slovenliness later on (she describes having to clean out his apartment); for his emotional coldness; for his refusal to talk about anything of consequence. But while cleaning up after him one day, she discovers in a box of items from the war some Nazi memorabilia. Thus begins the journey presented here, one filled with discoveries—about her father’s role as a spy (and assassin) in both theaters of the war, about her parents’ love (and its dissolution), about religion, about the author’s roles as sister, wife, mother. As she gradually begins to coax her father to talk about his past, complications arise: He exhibits signs of dementia, then is diagnosed with terminal cancer. But before he dies, she has come, through her understanding of him, to love him once again. There are tears and lumps in her throat. At the moment of his death, she sees a disturbance in the air around his bed, decides it’s God and practices thereafter a religious life that she abandoned long before. Much of her story deals with her research and with her discoveries, including a packet of love letters her father wrote to her mother during the war. She quotes long—often too-long—passages from them. She also reminds us throughout that she won a Pulitzer in 1971. A sturdy but overgrown narrative in need of substantial pruning.